A professional educator for more than 20 years, Dr. Eric Creeger has been honored as teacher and administrator of the year, served as an instructional technology coordinator, campus level administrator, and program manager for one of the first STEM Academies in the state of Texas. He has served as an administrator at the Academy of Irving ISD, a nationally recognized smaller learning communities program, developed innovative aviation and biomedical signature study programs, worked in the country’s largest Netzero Middle School, and has teamed with the Texas High School project to create a model STEM academy serving an at risk urban population. Dr. Creeger currently serves as a Senior Lecturer and Program Coordinator for Educational Leadership at the University of North Texas at Dallas. 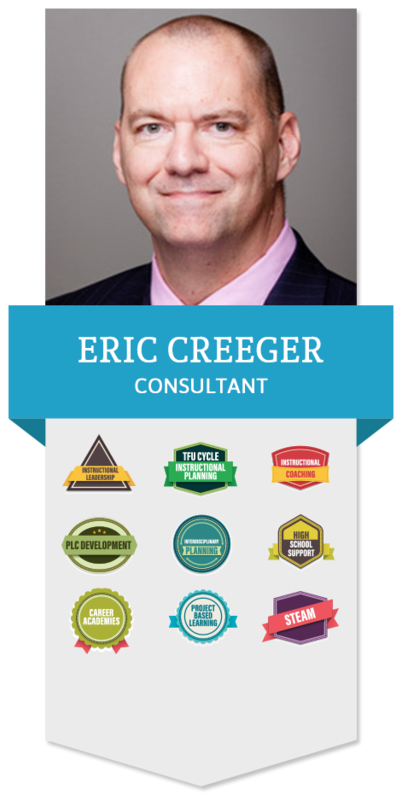 For the past 15 years, Dr. Creeger has also worked as an educational consultant, providing services across the country and internationally on topics such as high school redesign, academic teaming, differentiated instruction, and effective technology integration. He currently resides in Irving, Texas, with his wife Katie and their two children. Was part of the first doctoral cohort in Educational leadership at Dallas Baptist University. Treatise research and subsequent publications have been on the academic impact of implementation BYOD policies in schools with a history of 1:1 computing. Additional research interests include System redesign, leadership developments and using technology to transform teaching and learning. Currently developing, in partnership with the TI Foundation and UNT Dallas, a Masters program intended to develop leaders for STEM schools. Currently serving as Senior Lecturer and Program Coordinator for Educational Leadership at the University of North Texas Dallas. The International Society for Technology in Education.